Chocolate Brown Cheetah prints and feather boa bow, everybody say YEAH! 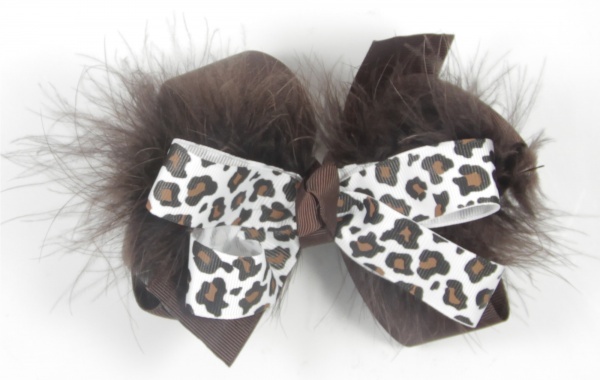 This is a sassy little bow that every Cheetah lover will have to get. There is 36 inches of a 1.5" chocolate brown bow on the bow and a chocolate brown feather boa in the center of this bow. The top layer is 22 inches of an ivory grosgrain ribbon with chocolate brown and black cheetah prints all over. The center is wrapped into a French knot with a brown grosgrain ribbon and attached to a French clip. This is the cheetah print bow you have to have.